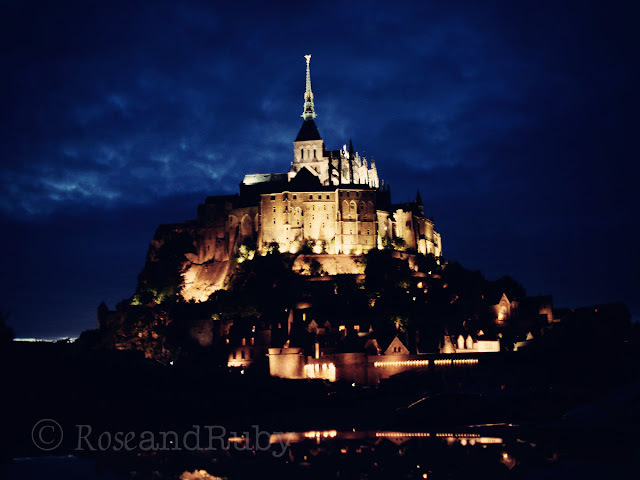 One of the many magical places, visually, that we visited in France was Mont-Saint-Michel. It takes your breath away. Literally. We fought the tourists and the tacky tourist stands during the day, as you do. But we came back around midnight and it was, well, a sorta fairytale (and a little bit spooky!) wandering around this amazing old walled city at night. I have never been there! and was jsut thinking about an Easter trip over there? Stunning pictures!! Oh my! This is one of my hubby's "must-go-travel".. and I guess that he's gonna be more and more convinced about it, when I'll show him your wonderful pics! this makes me want to travel to france even more! that place looks unreal! I read a book last year that was set on the island and I just couldn't picture it in my mind. In the end, I Googled it. When the images came up, my mouth fell open. Fairytale indeed! It's definitely just another reason to go back to France. This is dreamy! The first image is just unbelivable. All of them are. I've never seen a nighttime photograph - such a beautiful perspective! how beautiful is that!!! have a nice weekend! This looks so beautiful! Love your night shots! Magical pictures. I would love to go there. what a fabulous place! I will try to see it on my next time in France!...and your images of it are simply amazing! Oh my goodness...I wish I was there! Your blog is divine! Beautiful photo's! thanks for the share! Oh yes I remember this place so well. I used to live in France and visited Mont Saint Michelle several times. I agree with you on the tourist shops (so sad) but when you get to the top there are still some amazing little nooks to escape into. Oh how wonderful.. place and photography.. I've had two trips to France and somehow didn't manage.. Mont-Saint-Michel on either.. maybe next time.. It is somewhere I've been wanting to see for years..
Wow! I can see why it took your breath away. It's totally stunning. I quite like the thought of it being spooky at night time. I bet you could imagine all sorts of things about its history far better at night time.